Two new Rogue One: A Star Wars Story – Black Series 6″ Scale Figures have been revealed. DisneyStore.co.uk has posted a preview page for their upcoming Rogue One sales. 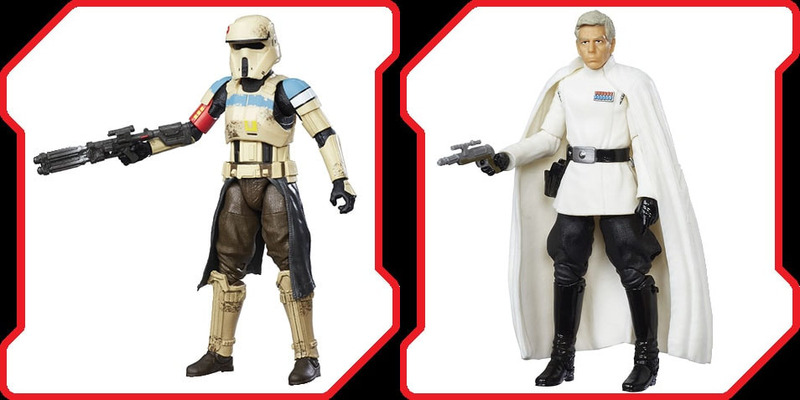 Included are 6″ scale Black Series versions of Director Orson Krennic and an Imperial Shoretrooper. No additional info was available at this time. We will continue to update as more Rogue One toys and collectibles are revealed. You can see these new figure by clicking the banner image above. I am loving the look of the Shoretrooper. If I am lucky I'll grab this Black Series version as well as the S.H. Figuarts version. Seem to have an easier time getting my hands on import figures I want lately rather than Marvel Legend and Black Series figures I want. Luckily got Jyn Erso pre-ordered on Amazon last night. Rest of the Rogue One stuff is out of stock. Will have to check often from now until Sep 30th it looks like. "Shoretrooper?" Does he patrol the shores to make sure people aren't swimming after the lifeguard leaves? "Shoretrooper?" Does he patrol the shores to make sure people are swimming after the lifeguard leaves? Shoretroopers also help inflate water wings for the kiddies and get umbrellas for your pina coladas!! They're also from South Jersey, and the Empire said "Have we got a job for you guys". Can you imagine how tanned they must be under all that armor? Must really bum them out to be so covered up on the beach. At least they can show off their guns still... literally.